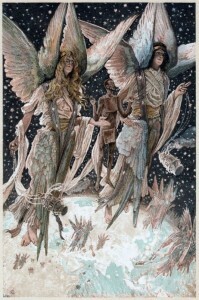 What could be more delightful than the concept of angels and a free angel reading to boot? A free angel reading, especially when we are down at heart, is an inspiring proposition. Maybe because we perceive angels as such loving beings, colossal entities of light, flying down from the heavens to help us with our problems. They cheer us up. We imagine their beautiful faces, long golden robes, massive wings, trumpets and halos, and their unusually tolerant attitude to our human foibles with an inner smile! Angels are indeed messengers of light; they are always with us, standing right next to us to protect us from danger. The more sensitive can feel their presence as tremors up and down the spinal cord, or a happy, warm feeling in the heart. Angels reside in the all encompassing universe and the inner court of God and they are celestial beings of higher vibrational frequencies, diverse to spirit guides in that guides advise humanity, but Angels intervene in moments of crisis, or when we yearn to feel universal love really does exist. They don’t have challenges like us humans, or suffer the effects of karmic retribution either, because they have never experienced life as a human on this earth. A guardian angel will be with you from birth to death. You could have more than one guardian angel, that you will have probably met them before you incarnated. They would have discussed your fate, and asked you whether you were really ready to be born on earth. You would have said yes, convinced you could overcome any problem that came up, but when times got hard on this challenging planet, you remembered them again and reached out for them, you even sought a free angel reading just to feel their light shinning within your heart. As we said, guardian angels have been known to intervene when an emergency occurs. A friend was about to pass through a red traffic light at three am in the morning, after returning from a rave. The street seemed deserted; it would have been so easy to go through the light as nobody was there. Suddenly, she heard the word “No!! !” screaming in her ear, it seemed, from nowhere. She was so shocked; she put her foot on the brake, and screeched to a sudden halt. At that very second a huge lorry sped down from her left, right through the cross roads; if she would have continued through the red light, she would have been killed. She is still convinced that “No!” was the voice of her guardian angel? Whenever we embark upon a free angel reading, we need to meditate and clear our mind of negative thoughts so that we can enjoy it. An angel reading could be computer generated with stunning angelic artwork and images to choose from, or picturesque cards filled with loving wisdom that line up automatically for us. The fact is angels are so all-loving in their attitudes; it would not matter to them if they communicated their healing energy thru a computer. In fact, angels will even enter the consciousness of another just to give us that special message of healing. Have you ever experienced someone saying just the right thing, perhaps with a wisdom you never thought they possessed? Jane was feeling depressed, she was a single mother and her boyfriend had recently left her. She had no money, or job, she felt rejected and down at heart. Suddenly, without warning her youngest son, Greggie, turned to her and said “Mummy I love you with all my heart” as if he was an adult and he was only three years old. She felt happy all of a sudden, and courage filled her, encouraging her to fight for her family and look at her future more positively. She always thought that day Greggie was speaking with the voice of an angel. So next time you go for that free angel reading, know that if your angel comes to you, it is with compassion and love, for they have flown across the universe and crossed that barrier stopping us feeling the love of our Creator. The fact is they are with you because they love you, it is that simple!